Pastor Daniel has been at St. Peter since July, 2016. As a 2016 graduate of Wartburg Theological Seminary, this is his first call. Prior to going to seminary, Pastor Daniel graduated in 2012 from Luther College in Decorah, Iowa, where he majored in religion and computer science and minored in music. Pastor Daniel is originally from Fond du Lac, Wisconsin, where he grew up on a horse farm. He is a lifelong Lutheran and was a charter member of Ascension Lutheran Church in Fond du Lac. His previous ministry experiences include working as a summer camp counselor, leading youth group activities and mission trips, and helping lead worship in college. During seminary, Pastor Daniel completed a unit of Clinical Pastoral Education at Mayo Clinic in Rochester, Minnesota, working as a hospital chaplain. 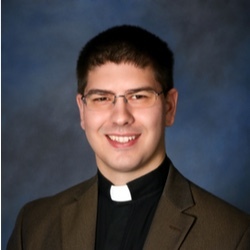 He also served for a year as the pastoral intern at St. Peter Lutheran Church in Dubuque, Iowa. Pastor Daniel married his high school sweetheart Christin on July 7, 2012. Christin also graduated from Luther College in 2012 with a degree in religion and sociology. She has a passion and vocation for youth ministry and is excited to share her gifts with our congregation as well. You can read sermons and learn far more than you ever wanted to know about Pastor Daniel at his personal website, www.danielflucke.com and find him at @danielflucke on Twitter, Instagram, and Facebook.